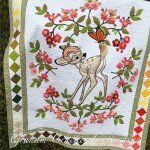 Learn hand applique and hand embroidery techniques for embellishing this adorable Bambi panel. 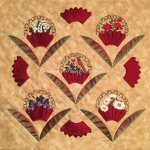 Receive tips on applique, dimensional flowers, broderie perse, and using basic embroidery stitches to add dimension to your quilts. Learn how to bind a pre-quilted square. Great rotary cutting is the first step to accurate piecing! Join Janet (who actually LOVES the rotary cutting process) for some tricks, tips and PRACTICE! This Pineapple Tool puts the fun back into Pineapple Quilts. Easy, accurate round after round. So grab your scraps for this easy way to a scrappy Pineapple Quilt. Go random, medallion or two color. And sewing them together is a lot simpler than you may imagine, it even amazed me! Receive pattern in class. See you there!! Don't let your birdies get away. Capture them forever in this beautiful quilt using only Traditional Piecing Methods. No paper piecing or templates used. This may be the quilt you have always wanted to make. See you there! This is a great binding technique for those projects you want to add binding to but don't want to sew down by hand. Need some great ideas for holiday gifts? Want to know how to make some fun gifts for throughout the year gift giving? Join Janet for this fun Mini-Retreat! We will make some traditional Cinnamon?s gifts (pillowcase, zipper bag and 10 minute table runner) and add a couple of new ideas, too! This sweet wool applique project is so much fun to make! It is a great way to get started with wool applique and can be done with machine or hand applique or a combination of the two. Simple shapes and easy piecing will have it made in no time. This gloriously whimsical quit is so much fun to make! Fat quarter friendly it would be great in lots of different fabric collections. We've played with the pattern instructions to make things easier for you and you'll have lots of fun putting your blocks together. 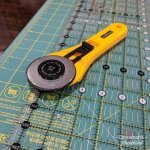 Many of you have seen the new 1/4" ruler foot that fits your traditional sewing machine. This is your chance to see how easy it is to get perfect patterns stitched with precision using a plastic ruler and the ruler foot. This is a great class to learn the very latest new way to machine quilt and get your projects done. Learn hand applique and hand embroidery techniques for making this adorable flower basket quilt. Tips on working with silk, specialty threads, and dimensional flowers. An absolutely beautiful quilt to make!! No two quilts will come out the same, even if you use the same fabric. Simple piecing and no Y seams! Looks hard but it isn't! Join Janet for a SWEET three-color quilt! We will learn to sew with Moda Cake Mixes in our first class and then in the second class we will assemble our blocks. You can choose to do a quilt, table runner or pillow-you determine how big a project you want to make! I fell in love with this quilt and you will, too! Pumpkin Maze is a variation on a triple Irish chain quilt with some fun fall pumpkins added! Cinnamon?s has made some great kits for this quilt but sign up for class and reserve your kit early-they are limited! The Scandinavian Tomte is just the cutest little holiday guy! He comes to use from Sweden and can be the protector of YOUR home! Join Janet and learn to organize your cutting, piece and assemble this fun quilt. Looking for a great project to use up scraps or a spare jelly roll or leftover fat quarters? Simple strip piecing and a clever way to make this easy block will have you using that extra fabric up in no time. Perfect for baby size to a king size quilt. Create a beautiful tablerunner and have it prepared LONG before the holidays begin! We will use Lori Holt?s Vintage Christmas book for this class. Bring your Kaffe Fasset Fabrics and All others plus a pattern or two you are considering and we will sort out all the fabulous colors, patterns and prints so they make sense. If you don't know what to do with your fabrics this class will give you a clear vision on how to work with all those gorgeous Fabrics with stunning results.